There are several reports describing the impaction of foreign objects into the exposed pulp chambers and canals by patients, especially children as they often have the habit of inserting foreign objects in the oral cavity. These objects will become a potent source of infection.This case report describes the retrieval of a foreign object impacted into the root canal of a 12-year-old male patient who was referred to the endodontic specialty clinic at Taibah University College of Dentistry. The patient's chief complaint was a pain in the upper left central tooth. Clinical examination revealed a complicated enamel-dentin fracture with a large caries cavity. A periapical radiographic image showed a radiopaque object in the root canal system. Stainless steel Hedstrom files were used to retrieve the object from the canal. Following a proper cleaning and shaping of the root canal system, an intra-canal calcium hydroxide dressing was placed for 1 week. The root canal system was then filled with sealer and gutta-percha using the lateral compaction technique and the tooth received an aesthetic restoration. Several techniques for retrieval of separated endodontic instruments can be used to remove the foreign objects from the root canal. The removal of these foreign objects from the root canal system, especially when it is extensively engaged with the root-canal walls, is a challenge and little information is available concerning management of foreign objects. The following case report describes removal of a foreign object impacted into the root canal system of a maxillary central incisor with wide apex using H-Files. A 12-year-old male patient refereed to the endodontic specialty clinic at the College of Dentistry, Taibah University (Saudi Arabia) with a history of pain in the maxillary left central incisor (#21). The tooth had dental trauma 3 years ago. A root canal treatment was initiated previously in a private general dental practice 6 months before he presented to the College of Dentistry clinics, however, the patient did not complete the treatment, 2 months later he suffered severe pain in the upper anterior area with a painful response to biting and percussion. Intraoral examination revealed oblique crown fracture [Figure 1]a] with extensive caries and pain on percussion. The panoramic radiograph revealed linear radiopaque objects in the root canal [Figure 1]b]. Local anesthesia was administered and the tooth was isolated by rubber dam. Following complete removal of caries, access cavity into the pulp chamber was performed using 014 round carbide and Endo Z burs (Dentsply Maillefer, Ballaigues, Switzerland). The pulp chamber was irrigated copiously with 2.5% sodium hypochlorite solution. The root canals were explored by K-file ISO No. 10 (Dentsply Maillefer, Ballaigues, Switzerland) with a lubricant (Glyde Dentsply Maillefer, Ballaigues, Switzerland). After several attempts the object was bypassed, a path glide was created by using K-Flexofiles ISO No. 15, 20, and 25 (Dentsply Maillefer, Ballaigues, Switzerland), then the Hedstrom files ISO No. 25, 30, 35 and 40 (Dentsply Maillefer, Ballaigues, Switzerland), used to retrieve the objects [Figure 1]c] which were like staple pins [Figure 1]d]. The root canals was shaped with F5 ProTaper rotary instrument (Dentsply Maillefer) with copious irrigation of 2.5% sodium hypochlorite solution and filled with calcium hydroxide paste (META BIOMED Co., Ltd.) then the tooth was sealed with temporary restoration. One week later, the patient recalled for the completion of root canal treatment. Local anesthesia was administered and the tooth was isolated with rubber dam. The Calcium hydroxide was removed, the canal was dried and a gutta-percha (Dentsply Maillefer, Ballaigues, Switzerland), custom master cone (No. 120) to the full working length was radiographically confirmed [Figure 2]a]. Then the canal was obturated with lateral compaction technique [Figure 2]b] by using the AH26 Sealer (Dentsply Maillefer, Ballaigues, Switzerland), and the tooth was restored with composite resin [Figure 2]c]. This case report was reviewed and approved by the Research Ethics Committee of College of Dentistry, Taibah University. However, the foreign objects into root canal need high skills and advanced techniques to remove from the root canal although in this case we used stainless steel files (K and H) to retrieve the foreign objects without damaging the internal tooth structure. The root canal treatment-in this case-was initiated in a private clinic after trauma but the patient did not complete the treatment and after several days the temporary filling was lost, resulting in impaction of food debris into the root canal system. This will cause infection of the root canal and the periradicular area. Leaving the root canal open can make an acute problem become chronic and can cause repeated flare-ups during further attempts to close it. In the present case, foreign objects lodged in the root canal were removed successfully by using a simple nonsurgical procedure. Sealing the access cavity with good filling will secure the root canal system from new strains of microorganisms, food debris and foreign body. 1. Sobol SE, Jacobs IN, Levin L, Wetmore RF. Pistachio nutshell foreign body of the oral cavity in two children. Int J Pediatr Otorhinolaryngol 2004;8:1101-4. 2. Prabhakar AR, Namineni S, Subhadra HN. Foreign body in the apical portion of a root canal in a tooth with an immature apex: A case report. Int Endod J 2008;10:920-7. 3. McAuliffe N, Drage NA, Hunter B. Staple diet: A foreign body in a tooth. Int J Pediatr Dent 2005;15:468-71. 4. Costa F, Robiony M, Toro C, Sembronio S, Politi M. Endoscopically assisted procedure for removal of a foreign body from the maxillary sinus and contemporary endodontic surgical treatment of the tooth. Head Face Med 2006;2:37. 5. Goldstein BH, Scuibba JJ, Laskin DM. Actinomycosis of the maxilla: A review of literature and report of a case. J Oral Surg 1972;30:362-6. 6. 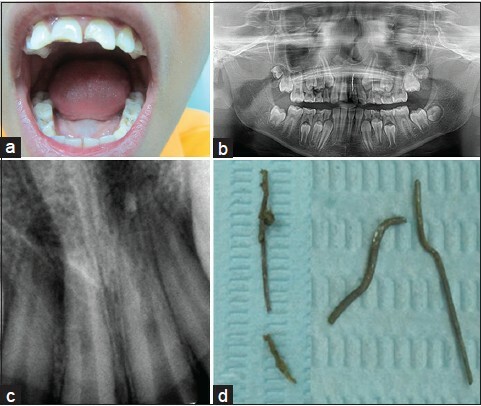 Lehl G. Foreign body in a deciduous incisor: A radiological revelation. J Indian Soc Pedod Prev Dent 2010;1:45-6. 7. Kataoka SH, Okai W, Caldeira CL. Removal of a nail into the root canal: Case report. J Health Sci Inst 2010;2:141-3. 8. Nadkarni UM, Munshi A, Damle SG, Kalaskar RR. Retrieval of a foreign object from the palatal root canal of a permanent maxillary first molar: A case report. Quintessence Int 2002;8:609-12. 9. Gadgil RM. Foreign incense. Br Dent J 2009;7:305. 10. Subbareddy VV, Mehta DS. "Beads," Oral Surg Oral Med Oral Pathol. 1990;69:769-70. 11. Chand K, Joesph S, Varughese JM, Nair MG, Prasanth S. Endodontic management of an unusual foreign body in a maxillary central incisor. J Conserv Dent 2013;5:474-6. 12. Holla G, Baliga S, Yeluri R, Munshi AK. Unusual objects in the root canal of deciduous teeth: A report of two cases. Contemp Clin Dent 2010;4:246-8. 13. Hülsmann M. Methods for removing metal obstructions from the root canal. Endod Dent Traumatol 1993;9:223-37. 14. Glickman GN. Consensus conference on diagnostic terminology: Background and perspectives. J Endod 2009;35:1619-20. 15. Gary GS. Instrument fracture: Mechanisms, removal of fragments, and clinical outcomes. Endod Top 2009;16:1-26. 16. Roda RS, Gettleman BH. Nonsurgical Retreatment in COHEN'S PATHWAYS OF THE PULP. 10 th ed. St. Louis, Missouri: Elsevier Mosby; 2011. p. 901-10. 17. Hülsmann M, Schinkel I. Influence of several factors on the success or failure of removal of fractured instruments from the root canal. Endod Dent Traumatol 1999;15:252-8. 18. Ward JR, Parashos P, Messer HH. Evaluation of an ultrasonic technique to remove fractured rotary nickel-titanium endodontic instruments from root canals: Clinical cases. J Endod 2003;29:764-7. 19. Ward JR, Parashos P, Messer HH. Evaluation of an ultrasonic technique to remove fractured rotary nickel-titanium endodontic instruments from root canals: An experimental study. J Endod 2003;29:756-63. 20. Madarati A, Rekab MS, Watts DC, Qualtrough A. Time-dependence of coronal seal of temporary materials used in endodontics. Aust Endod J 2008;3:89-93. 21. Byström A, Claesson R, Sundqvist G. The antibacterial effect of camphorated paramonochlorophenol, camphorated phenol and calcium hydroxide in the treatment of infected root canals. Endod Dent Traumatol 1985;1:170-5. 22. Beatty RG, Zakariasen KL. Apical leakage associated with three obturation techniques in large and small root canals. Int Endod J 1984;17:67-72. 23. Keane KM, Harrington GW. The use of a chloroform-softened gutta-percha master cone and its effect on the apical seal. J Endod 1984;10:57-63. 24. Leonardo MR, Silva LA, Utrilla LS, Leonardo RT, Consolaro A. Effect of intracanal dressings on repair and apical bridging of teeth with incomplete root formation. Endod Dent Traumatol 1993;9:25-30. 25. Andreasen JO, Farik B, Munksgaard EC. Long-term calcium hydroxide as a root canal dressing may increase risk of root fracture. Dent Traumatol 2002;18:134-7. 26. Rosenberg B, Murray PE, Namerow K. The effect of calcium hydroxide root filling on dentin fracture strength. Dent Traumatol 2007;23:26-9. 27. Shabahang S, Torabinejad M. Treatment of teeth with open apices using mineral trioxide aggregate. Pract Periodontics Aesthet Dent 2000;12:315-20. 28. Hargreaves KM, Giesler T, Henry M, Wang Y. Regeneration potential of the young permanent tooth: What does the future hold? J Endod 2008;34:S51-6. 29. Trope M. Regenerative potential of dental pulp. J Endod 2008;34:S13-7. 30. Madarati AA, Qualtrough AJ, Watts DC. Endodontists experience using ultrasonics for removal of intra-canal fractured instruments. Int Endod J 2010;4:301-5. 31. Ozsezer E, Ozden B, Kulacaoðlu N, Ozden FO. The treatment of unusual foreign objects in a root canal: A case report. Oral Surg Oral Med Oral Pathol Oral Radiol Endod 2006;6:e45-7. 32. Srivastava N, Vineeta N. Foreign body in the periradicular area. J Endod 2001;27:593-4.